For today’s deals roundup, we’ve brought to you the top five Bluetooth headphone deals on Paytm Mall. The list contains products from brands like Crossbeats, Skullcandy, boAt and more. Finding the right headphone that perfectly fits the bill, within a tight budget is a difficult task. We’ve decided to make the job easier for you by finding some deals on Paytm mall. The list contains headphones from brands like Skullcandy, Crossbeats, JBL and more. The Crossbeats Neo is a sweat and waterproof wireless headset, which lets you listen to music while you working out without worrying about sweat. It comes with aptX and Bluetooth 4.0 connectivity that allows you to stream music up to a distance of 10 meters from the connected device. You can purchase this device here. The JBL T110 BT In-Ear Headphone sports a tangle-free flat cable and comes with a magnetic latch that prevents the earphones from falling down when not in use. The earphone has an in-line remote that allows users to answer/reject calls easily. As per the company, it can provide six hours of music streaming with two hours of charge time. You can purchase this device here. The Skullcandy Jib In-Ear Wireless Headset comes with an in-line microphone and remote for taking calls and managing audio tracks. The headphone weighs about 200gm and as per the company, it can provide six hours of audio playback. You can purchase this device here. The TAGG T-07 is a sweatproof in-ear Bluetooth headset, which comes with an in-line microphone and remote to manage audio tracks and calls. The headphone features a Bluetooth 4.1 technology and is equipped with a passive noise cancellation feature. As per the company, it can provide five hours of continuous listening. You can purchase this device here. The Crossbeats Ultra Sports Bluetooth headphone is a sweatproof device. 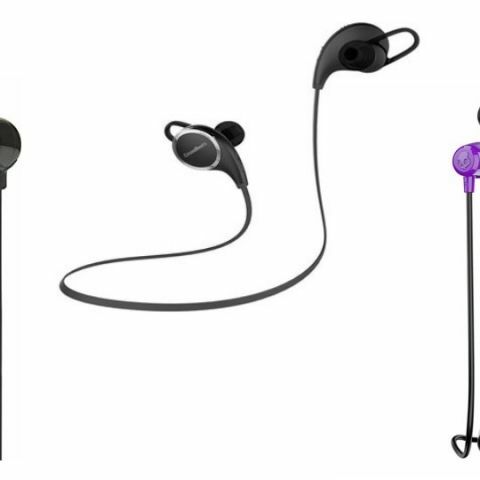 The earphones can be paired with up to two Bluetooth devices at once. As per the company, it can provide seven hours of audio playback with two hours of charging time. You can purchase this device here.